Mr. Eeli Friman, a student and a research assistant at the Turku School of Economics at the University of Turku, conducted his master’s thesis under the title “Foresight Study on Transport and Logistics in the Baltic Sea Region by 2030”. The thesis was a part of the HAZARD publication series and the results of the thesis were presented at the Final Conference in Tallinn on 15 March 2019. 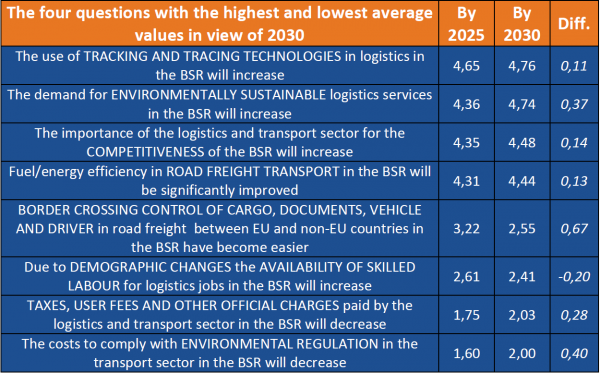 The purpose of the study was to map the transport and logistics outlook of the Baltic Sea Region (BSR) until year 2030 by surveying a carefully selected and authoritative expert panel from the entire region (excluding Belarus). Data was gathered through a two-round Delphi survey in late 2018 and early 2019. The purpose of this method is to allow consensus to be achieved between the participants. A total of 97 respondents filled a survey questionnaire comprising 52 questions, which were organised under 10 themes. See Table 1. Initially, participants evaluated their level of expertise on each of the ten themes. Figure 1 illustrates the panel’s aggregate level of expertise in each of the themes in descending order. 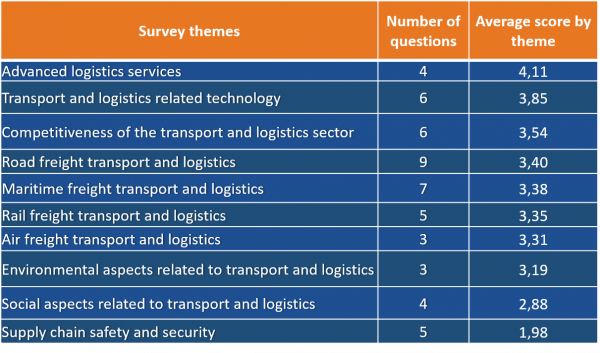 The respondents seem to be most knowledgeable with competitiveness and environmental aspects in BSR transport and logistics. 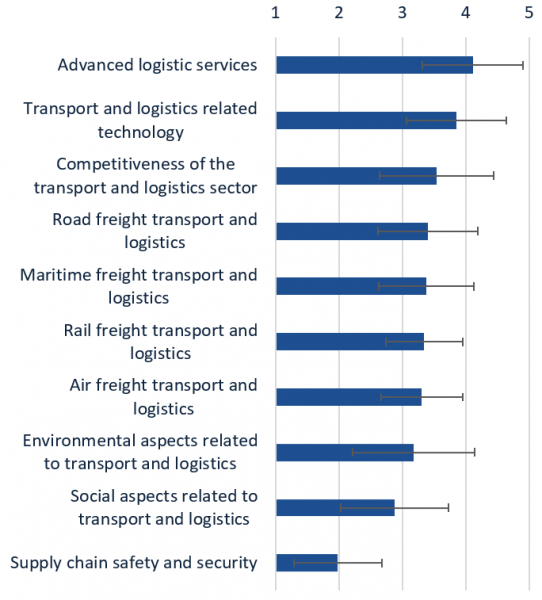 However, air and rail freight rank the lowest and significantly below, for example, maritime and road transport. Figure 2 depicts the weighted average answers and standard deviations for each of the ten themes. A five-level scale was used in the questionnaire. With the environmental theme, the respondents were rather hopeful that greenhouse gas emissions could be reduced in the future. 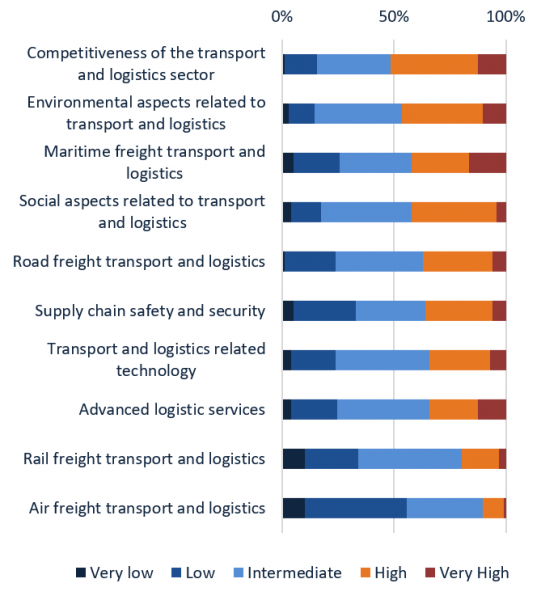 This goes hand-in-hand with the expectation of increased demand for environmentally friendly logistics services. High values (around 4 or above) were received also with advanced logistics and technology themes. The safety and security theme was the only one scoring below two, due to elevated expectations of higher costs to improve security measures and to counter the anticipated increase in logistics related criminality. Especially cyber threats were expected to increase in importance. The study is a follow-up of an almost identical study by Ojala et al. (2013) which focused on year 2025. This follow-up gave us the opportunity to see how the attitudes have changed. Table 2 shows the four questions with the highest and lowest average values in view of 2030 and compares these with the identical questions in Ojala et al. (2013). The highest and lowest scoring questions were largely the same in both studies. The costs to comply with environmental regulation were deemed most problematic in both studies. Comparing the two studies, the largest single deterioration was dealing with border crossings between EU and non-EU countries by road freight. A comprehensive report on these findings, with all the 52 questions reviewed individually, will be published in April 2019. Additional information about the study and appendixes related to it can be found in the PDF file below. Reference: Ojala, L. – Kersten, W. – Lorentz, H. (2013) Transport and Logistics Developments in the Baltic Sea Region until 2025. Journal of East-West Business, Vol. 19, 16–32.